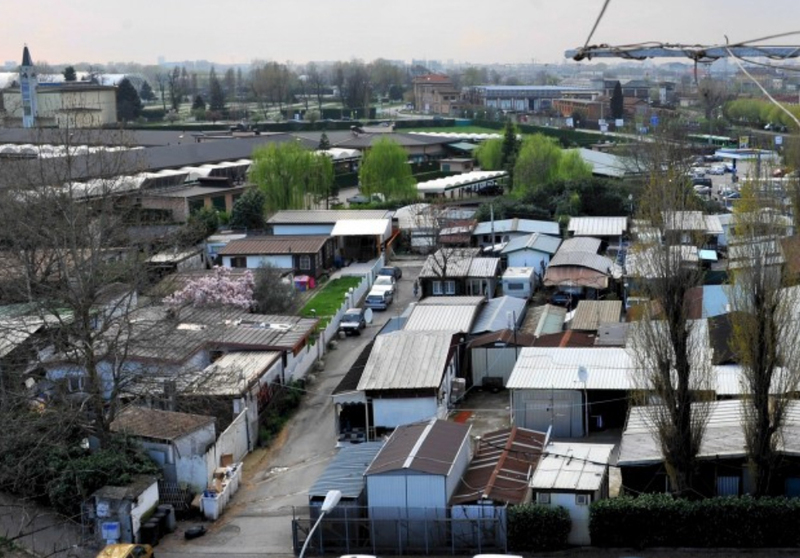 At the eastern periphery of Milan, since 50 years a community of carnies has settled in the municipality of Segrate. Working in the leisure park and living nearby in a sort of secluded informally built village. 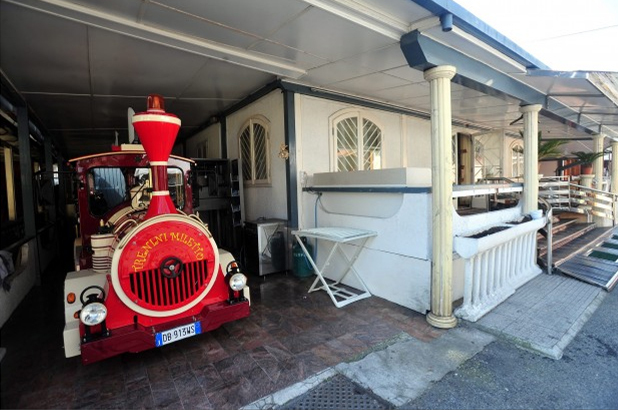 About seventy Italian families, perfectly integrated in the physical and social context they live in. They call the whole caravans’ settlement “the carnies’ city”: from the outside it appears as a gated community. A collective organization arose from common needs (such as shelter and workplace) the factor able to create cohesion in the settlement, rather than the whole of a multitude of individual choices. However, as in other better known examples (Christiania in Copenhagen, for instance), the combination between the multitude of individual choices and the sharing of spaces and decisions expresses the peculiarity of such a living solution. The most representative issue of this is the matter of acknowledgment towards the surrounding communities and the representativeness and dialogue with the institutions. Which are the steps of the settling down of this community? What sort of institutionalisation process was undertaken in such an informal solution? These are some of the few questions that an intense field exploration tried to address. There is a piece of USA right outside Milan, hidden at a first sight and not easily accessible. Though, the people living this place do speak Italian, most of them come directly from Milan or nearby regions, such as Veneto or Tuscany. They are a sort of gated community, a fence surrounding the houses, but they do not live in luxury villas, neither they control the entrance to the settlement; knocking and asking for permission is enough to accede the private space. They have an internal, shared and strict body of rules, but they are far away from Kubrick sects we are used to see in movies. They are the biggest community of Italian carnies, settled since years in the municipality of Segrate, at the eastern periphery of Milan, and they can be considered one of the most atypical experiments of communitarian living in the city. The aim of this short paper is to convey the history of the settlement (città dei giostrai, city of carnies) as a reflex of a multitude of stories of the single families living and working there; in this moment particularly, the sense of a strong and closed community prevails on the cliché of the playful and open character of the carnies, having they to face some potentially dangerous events – that is, the eviction from the area they live in due to an unauthorized building violation. The methodology used for this study investigation was firstly to look at the press review, which is essential to understand the current situation (some articles revealing particular thorny details have been the cause of the community enclosure). Two field inspections aimed at building a personal contact with some members of the community, in vain. Though the interviews which have been taken (on the sly) do completely confirm theoretical suppositions, they are not deep enough to build up a family biography or a personal history. However, basing on the fragments of two interviews, as much very different biographies will be partially told, in order to complete the general impressions and information of the paper. A first interesting consideration should be spend about the expectations that rise along the way to città dei giostrai. Knowing the particularity of what is being searched, the perception of the progressive Americanisation of the landscape follows the researcher “on the road”: exiting Milan along via Rivoltana, after a mini-golf yard the huge walled area of Linate goods rail yard is replaced first by dismissed baroque industrial buildings, than to a big (underused) exposition centre flanked by a one-night-stay motel and a car wash; finally, the presence of the carnies’ caravan settlement is high-lighted by the electric signs of the drive-in and by the thirty-meters-high glittering Ferris wheel of the amusement park. This long Americanisation process throughout the years corresponds to the progressive settle down of the community, towards a more non-migratory residential form. 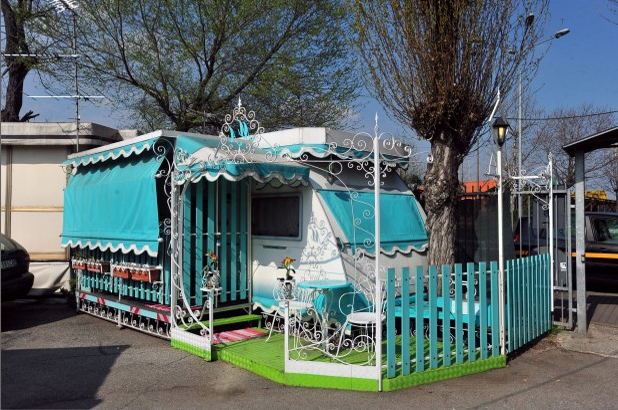 Caravans’ personalisation and improvement mirror the huge monetary investment on one’s living, and are directly connected to the dimension of working. Nevertheless, this brought to a social stratification inside the community, weakening sometimes inter-communitarian relationships which characterized the ancient mutual support of the whole carnies settlement. The first carnies settled in the area around 1963, when the amusement park was meant to be placed in an empty area between Linate goods rail yard barrier (at north) and the agricultural fields at south-west. 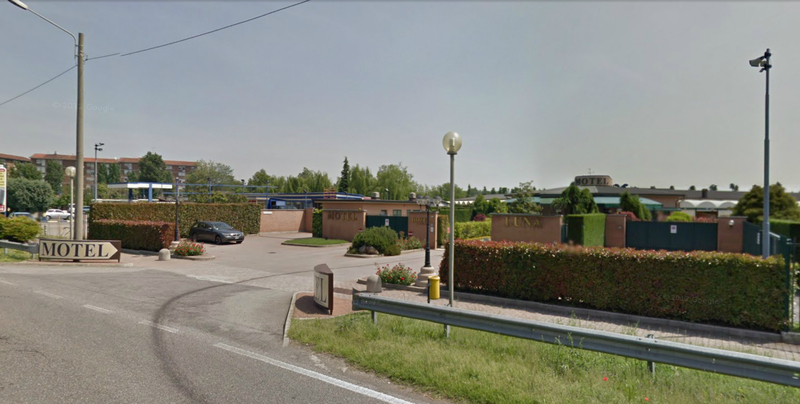 The decision was not hazardous: since 1930 the eastern periphery of Milan was characterized by the presence of the artificial water basin Idroscalo (located a few meters south-east from the area), meant to be place for sport facilities and recreational activities. Since the area was attractive mostly during the summer season, the amusement park worked at the beginning only 5 months per year. And so did the carnies, who lived itinerantly inside the amusement park in its opening periods and later into an area located in front of it, renting from a farmer of Novegro village. 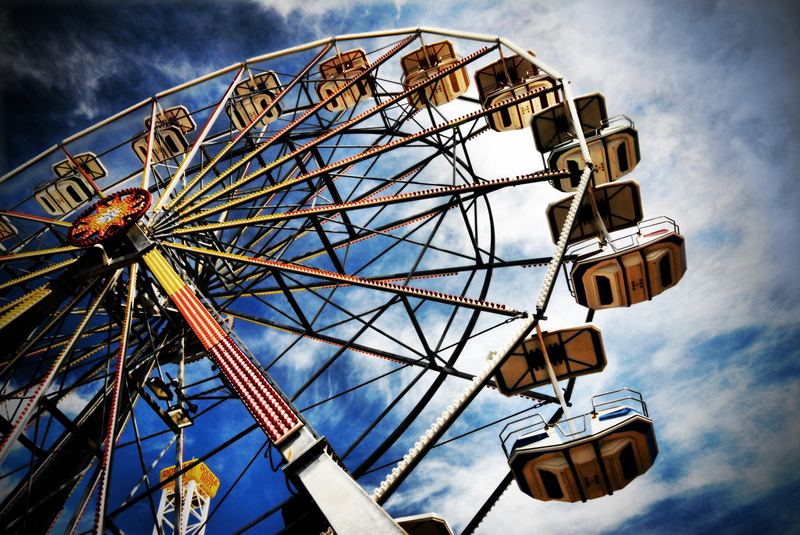 In 1968, the national law concerning traveling carousel activities entered into force, asking each Italian municipality to provide a framework for the management of amusement parks, circus and the related settlements for the workers. Consequently, the 2 of February 1972 the municipality of Segrate gave the official permission to settle down the carnies’ settlement permanently, inside the area where it is still today. This brought through the years more and more modernization works, sidewalks, the connection to gas, water and electricity networks, the realization of a drainage system and the construction of garages, the collection of waste (and the payment of the related TARSU tax) and the request for taking up residency (the formal address is via Dante 2). In this first “pioneering” phase the first relationships among families were formed, lasting for more than 35 years. The theme of work has always been central, and it has a fundamental dimension for the organization of the settlement as well, occupying an important part of the daily life – even if referred to the housing dimension. The reception and integration of newcomers and the self-support and mutual assistance have characterized so far a nomadic community which starts to become stable, varied and fragmented and which sees in the amusement park and in the law just entered into force the only ways for its affirmation and acknowledgment at the local level. The acknowledgment of the carnies community led to some problematic issues to be solved. At first glance, as it has already been told, living permanently in a place meant to have access to certain rights, but to perform some duties as well. Adaptation works and taxation are the downside of the coin for being recognised and accepted as residents. Indeed, to turn a temporary settlement into a permanent one requires several other types of fulfilments: the community adopted shared rules based on cooperative living, a clear and defined standing about newcomers, an informal road numbering system to give a recognisable address within the settlement, and even an internal plan with the tacit approval of the municipality to regulate the construction of roads and the expansion of new caravans, without renouncing to the privatisation and the ownership of each families’ (or individuals’) land plot. However, in more recent years (from 2011) the municipality of Segrate focused its attention on the carnies’ city, finding out that, although taxes and fees are regularly paid, the area on which the settlement stands is still formally recognized as farmland. This question (which has been raised paradoxically from a member of the community itself) brought to a legal controversy and to an inspection of the abuse by the granting authorities (the violation is however prescribed, since it happened at first more than 40 years ago), but rose up some secondary problems. Among the others, the trustfulness of the community in its own members and ruling system, and the relationship between the carnies, the institutions and public authorities, and the “common” citizens. The major visibility of the carnies’ settlement brought to the front page a not so predictable question: why is there such a current focus on this bunch of caravans, having they occupied that place since 50 years already? How can an administrative pro forma strongly influence a reality that was able to create throughout the years social and economic bonds with the surrounding, so that to vanish the adjective nomadic for a steady housing condition? The answer seems to have a political constituency. The 500 estimated inhabitants of the settlement do represent, with 300-400 adult persons, more than 10% of the voting population referred to Novegro district. Quite an important number, counting the presence of a carny into the municipal council (for the right PdL party) and the businesses generated by the entire community (even if official statistics number only 42 people in Segrate employed in the sector of carousel and travelling entertainment). For the opposition party, carnies are one of the strongest local lobbies, able to exploit their political influence in order to overcome (informally) to some common problem affecting the other inhabitants. The acknowledgment of collective living passes through political consensus. The historical evolution of the carnies’ city is indissolubly related to the entrepreneurial initiative undertaken with the settle of the amusement park and its success or unproductivity. 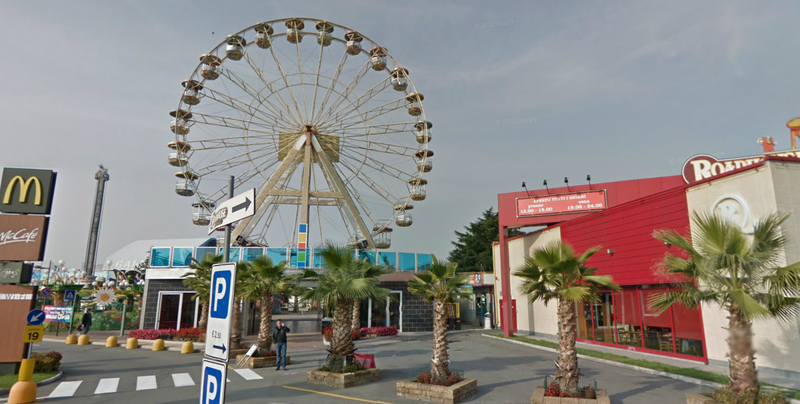 In fact, as confirmed by the case of Trebino family, offering always newer attractions for the public is a particular relevant matters and the first worry for a carny, especially in the “biggest amusement park of northern Italy”. To remain competitive into the amusement park, families must obviously rely on the location of their carousels, near the entrance for example, near the restaurants or the biggest attractions (normally owned by private investors unrelated to the community); but the costs concerning the improvement and the diversification of the amusement offer, the quality and the creativity of banners, the additional machineries contribute as well to the overall appeal of the amusement attractions. This competition creates also in this case winners and losers, and is reflected upon the spatial division and organization within the settlement. Unlike it may seems, positional advantages derive not only from the arrival time of a carny; some families have “a shooting gallery, two carousels and the red-flame train. My eight children live here with their own families, in front of my house, besides and behind it (indicates four-five big houses right nearby the entrance of the settlement). They are carnies as well, they have some carousels and other attractions. One of them is involved in the municipal council”. Even if carnies consider themselves as a cohesive and cooperative community, time and money contributed in stratifying their society as well, clearly distinguishing the powerful families to newcomers or the last arrived ones. As a matter of fact, the first thing to show one’s personal success and individual achievement (in a private way, in this sense, few inclined to communitarian and collective relationships) is the housing dimension. More in detail, the improvement of the house perfectly mirrors the economic well-being and welfare tendency of a family or an individual, revealing as well the family constituents. When a carny starts to work in the amusement park, he/she is given by the owner a container-module with water and connections. Is the personal investment what that creates the joyful variety which distinguishes this fairy-tale carnies’ settlement: a house looks like a cartoon, another one seems high-tech with stairs and steel railing; there are stonework houses, houses with garden and slipway for children, a villa with trees, a wooden mobile house and caravans. “My house is composed by three modules, which I lumped together throughout the years, spending more than 10 thousand euro for each construction”. This house is now about 200 square metres size; on one side, a table for twenty persons in marble-like with fake green diamonds and white candles on it. Two columns separate it from the living room, a huge golden sofa and a last generation cinema screen hang on the wall. Outside, a barbecue looks on the garage from above. An Audi and a Harley Davidson are parked there. The paradigm of living together individually. Collective housing is a progressive mechanism for consensus building: inside a community at first, and as the formal acknowledgment of it to the outside world. In the carnies’ city case (as in many others: a good example in this sense is Christiania community in Copenhagen) this matter reveals itself quite clearly with the self-organization and the self-acknowledgment that this little community was able to consolidate in time, thanks to its political and economic importance in the local social tissue. However, there are at least three aspects that deserve to be deepen; they are direct expressions of how the housing dimension influences (or is influenced by) some daily practices of communitarian living. The first aspect is related to work, as it is the best example of a transversal behaviour affecting particular aspects of an individual’s life. Success and achievement at work strongly condition the choice for a housing solution and the possible extra-investments relied onto it. However, it may also be considered a strong stance on the belonging community: in this sense, Trebino family became throughout the years the spokesperson of the whole carnies’ community (the word chief, however, would not be totally inappropriate). In other cases instead, the clear separation between the living and working dimensions coincides with a step away, in this case from the consolidated praxis of living collectively in the carnies’ city as the natural consequence of working into the amusement park. Guglielmo Calegari (nicknamed Memo) expresses perfectly such a concept: “I have been retired since nine years, when I sold my carousel to some Russians. They do not live here with us, but in the redbrick houses on the other side of street, watching us from above. They favour an easier and more stable housing solution”. The second aspect underlines how collective housing mirrors and pictures the ideal of a certain community, and how this image labels permanently some concepts, especially when observed from an external viewpoint. If this may be a strength, an introducing statement for a multitude of singular individuals, on the other side it is often leading to stereotypes and misunderstandings which may harm the community itself. In the case of the carnies’ city, the singularities of the adopted housing solutions (whether are they caravans, mobile or temporary houses, modular modules) created a diffused certainty among the locals about the inhabitants being foreigners and nomads, or in one word: rom. 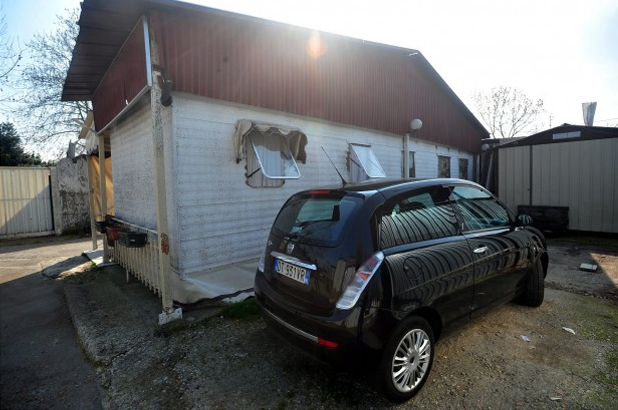 Obviously, the unsolved question about the emergency management of illegal gypsy camps in the peripheral belt of Milan contributed to sharpen the suspiciousness towards the carnies’ settlement. It is however true that, nearby the open, joyful and cohesive image of carnies, housing conveys an uneasiness caused by the misrecognition of the values characterizing the carnies’ community. The third aspect of collective housing is the constant contraposition between community and individual, between public and private dimension. If on the one hand living collectively means to re-arrange practices and attentions, tensions and values, attitudes of a whole community, on the other hand it leads inevitably towards the privatisation of housing and of the domestic sphere, being mostly the only expressions for an individual (familiar) monetary investment. Referring to the carnies’ city, this brought to a progressive underuse of collective spaces, which have been by now reduced to the streets and the inner squares, to the garages and, at the family level, to some shared patio or garden. How have been these three aspects acknowledged from the carnies? From the community viewpoint, collective housing led to a high capacity of self-management, to a direct democracy governing system and to a coherent and cohesive representativeness outwards (institutions, committee, media). However, the enlargement of the community, the need for an augmentation of more practical and quickly effective decisions brought to an informal elective democracy, in which the acknowledgment of a spokesperson-leader represents the voice of the entire community. From a more individual viewpoint, the material value of property gained the upper hand on the collective dimension of housing, bringing towards a more and more evident and rational privatisation of spaces. Though, the personalisation of the houses is still the main cause of the overall singularity of the settlement, and it did not supplant the recourse to some mutual-assistance forms to concentrate monetary resources on the only private sphere: “the entire community take in charge the costs for the settlement of newcomers; if someone has a problem, for instance a boiler gets out of order, in two weeks the problem is fixed. And, if there is some money shortness, or if someone is not able to afford the costs, everything is paid in advance by the administrator (indicates Trebino’s house and laughs). Things work better than in a condominium here”. A consideration in particular must be done and referred to new generations. If some carnies were born and grown up in Segrate when the city was still developing, the new-borns, the second carnies generation (from 1990) are perfectly integrated with the local community. They went to the same schools, had the same group of young friends and worked (when the amusement park is closed, in the week during the winter season) in local bars and restaurants: “the youths are working in winter at the restaurant “Le 3 Marie”, where they install the illuminations for the Christmas time”. What do the youths represent for the carnies’ community? At the first place, labour force: they help in the management of the amusement attractions owned by their families, succeeding and taking over the parents’ activities or contributing to their improvement and amelioration, gaining gradually their independence. Differently from the first-borns, who contributed more actively to the settlement’s development and to the community building (the best example is one of the sons of Marco Trebino, currently the “official apartment block administrator” of the settlement), the new-borns are mostly the bridge connecting the community and the adjacent district: “our children went to school with their coetaneous of the houses in front of the settlement, they go now to the same bars and pubs, hanging out together”. Little by little, new generations constituted the gradual amalgam and the progressive integration of the carnies community in the local tissue. The case of the carnies village in Segrate high-lighted several issues to be taken into account when referring to informal experiments of collective housing. If on the one side, carnies have to face daily concerns which affect the most of the condominiums, on the other side they constitute a very singular example of overlapping of different topics characterizing the community living. The carnies’ political weight stresses indeed the frequent connections between self-standing communities and political engagement, though this topic loses here its idealistic meaning, if referred to such examples as Christiania in Copenhagen, or to the Hamburger Gängeviertel. Political influence plays a fundamental role in the acknowledgment process of a community. Another key-point is the degeneration of the direct democracy into an elective representativeness. Decision making appears to be always functional (and sometimes even more practice) and the collective dimension prevails: mutual assistance and self-support are downsized, but individual help and neighbouring solidarity are still diffused and stronger than in “normal” housing situation. However, this governing system exacerbated the internal differences and the on-going social stratification inside the community: in this sense, the progressive privatisation of one’s living environment brought the house to be the mirror of a family’s (or individual’s) wellbeing. Yet the housing dimension is at the end what distinguishes carnies from the neighbouring inhabitants: even if they are perfectly integrated within the local community, a sense of closure and differentiation from the others (the outsiders) is perceivable. This is obviously a result of the social homologation happened throughout the years and based entirely on the recognition of members as carousel workers; however, the most recent events (and their divulgation and broadcasting through national media) increased the enclosure of the community and the fear for the strangers, sharpening on the one side the individualisation and privatisation of carnies’ lifestyle, and producing on the other an always growing ghettoization of the community, making it losing the openness which characterized the first settlement. The two presented biographies were extrapolated by a fragmented interview, taken on the 2 of February in the carnies’ city in Segrate. A first attempt was made in June, with a urban planner colleague, and brought nothing but a chat with an old lady. Therefore, during this second visit it has been decided to hidden a recorder. Pretending to be students of Politenico without no purpose except looking around, my brother and I got access to the house of Marco Trebino, who did not agree to let us take some pictures, neither of his house, nor for the surroundings (the carnies’ city is, in fact, a private property). Later on, we run into Memo, who friendly answered our questions. He too was, however, reluctant to tell us about his personal living and private sphere. Marco Trebino, around 60 years old, is a tall white-haired carny. Well dressed, married, he has 8 sons and daughters who work as carnies as well (one of them is engaged in the municipal council). His family comes from Lombardy, from the province of Milan, and is traditionally employed in the carousel and travelling entertainment. He lives with his wife in the carnies’ city since 35 years, and owns now a shooting gallery, two carousels and the red-flamed train (he did not tell which attractions are owned by his sons and daughters). His housing experience started as the other carnies by owning only one module, but he enlarged his house adding two more, for a total expense of more than ten thousand euro (furniture and interior design excluded). Considering also the houses of his family members, they occupy almost an entire street of the settlement (the closest to the entrance), and own the most visible and important buildings in the community: garages, columned patios with barbecues, steel stairs, powerful coloured walls. This obsession for appearance is transferred on the interiors as well: fake marble columns, large screen television, golden sofa and big crystal chandelier, fake diamonds scattered on the long table (for an estimated cost of several thousand euro). His wife, a 60 years old lady, seems to take care about her dressing, make-up and hair. She is cooking but she look quite elegant indeed. She is obsessed by journalists, by a possible publication which could eventually come out of our visit. She asks if our purpose is to take pictures of the settlement, and argues that without a strong motivation it would not be possible to stay there. During the interview with her husband, she passes by three or four times, telling always that the lunch is ready. In the kitchen, a housemaid is cleaning the cookers. Guglielmo Calegari, called Memo, is a friendly old man, without fore-teeth. He comes from an itinerant carnies’ family: at the question “where do you come from?”, he curtly answers “I am Italian”. More specifically, he was born in Florence and lived there for two weeks, before moving around northern Italy to follow seasonal fairies. He stopped for a while in Turin, where he took the medical examination for the national military service, which he accomplished in Rome. He had two sons (who are now living in France, working as carnies too) and moved finally to Milan, where he started to work for the Luna-Europark. Memo is proud about his origins and living style, so that he is prideful to assert that he lives in a simple caravan, the same with which he moved to Segrate 30 years ago. He agrees upon the fact that, having elected a leader/ reference for the improvement works of the settlement, the situation is now way more functional. He has some regrets about being retired: nine years ago he sold his carousel to some Russian entrepreneurs, that are living in the redbrick houses on the other side of the street, outside the settlement. He argues that foreigners (mostly Russian and Chinese) are contributing to the change of the amusement park and to the diversification and improvement of the overall attractions offer, but they are also fragmenting the carnies’ society. Before we go, he tells about the youths of the community, clarifying how their interaction with local shopkeepers and population is strengthening the relationship of the entire community. This report is the result of a former research, started in July 2012 with a series of informal field visits to the carnies’ village in Segrate, together with a friend and colleague of the association 8PM. Eight Planning Minds. In autumn 2012, the variety of considerations and reflections finally found an opportunity to be concretized in a text which was presented in the frame of the Urban Ethnography course at the School of Architecture and Society, Politecnico di Milano (hold by professors Massimo Bricocoli and Alessandro Coppola).